1) Sherbet Punch. Buy two bottles of 7 Up and one box of sherbet (flavor and color of your choice!) Combine in a large punch bowl. Magic. People love it and it will cost you less than $5.00. It's also something you can make on site. For an adult party I highly recommend you spike this with a little vodka. 2) Antipasto Platter. If you need to bring something a little more sophisticated, I recommend an antipasto platter. Buy a container of mixed olives from the salad bar at your local grocery store, a couple of packages of pre-sliced salami varieties, a container of soft mozzarella balls (drain the water, add a little extra virgin olive oil and fresh/dried herbs and mix to make them fancier), some sharp cheddar cheese and some crackers or bread. Arrange on a large plate/platter. If you roll a mozzarella ball in a salami blanket your palate will be so pleased! Other additions: roasted red peppers, marinated artichoke hearts, you name it! The last one I made for a party of 45 cost me a little less than $30 and wowed the crowd. 3) Pizza Dip. I have certain friends in Bellingham who BEG me to bring this to every occasion. It's only 4 ingredients and won't cost more than $8.00. Spread all of the cream cheese onto the bottom of one of your nicer casserole dishes using a silicone/bendable spatula. Make sure you let the cream cheese soften before you spread. Pour pizza sauce on the top - you may not use all of it, just spread evenly over the top. Sprinkle with Italian cheese blend. Top with any kind of toppings you want: peppers, pepperoni, olives, mushrooms, whatever. I'm a purist and like this so much I don't think it needs a topping but I'll let you decide. Sprikle with oregano if you want. Bake at 350 degrees until the cheese is bubbly and brown (about 25 minutes). Let cool slightly and serve with a side of tortilla chips. (or crusty bread but tortilla chips are honestly the way to go in my opinion.) This is the best thing ever. Ever. Might even rival my World's Best Baked Brie. I didn't just say that. Also, I have a confession. I didn't take either of the above pictures. 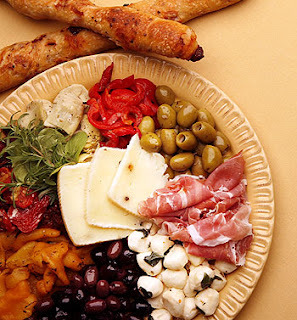 Photo credit for the antipasto platter goes to Ikea (what? yes) and pizza dip photo I got from the ladies and gent at livelovepasta. If you're into food bloggers you should definitely check out their site. Their recipe for pizza dip which you can see here is more complicated than mine but probably tastes just as good if not better. Also, please know I normally like to take my own photos but it was important to me that I arm you with these ideas BEFORE the weekend and that's the only time I'll have time to make mine. Love all the great ideas - I saw a antipasto platter down with layers in the shape of a Christmas tree with rosemary thrown in as garnish to add to the branches look. 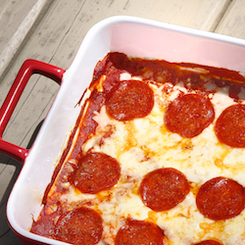 I will be making your pizza dip soon, it is always a hit and so easy. I cheated on my pics as well! Ha ha! The antipasto platter looks impressive - I'm glad to have a cheat sheet for that! I made your sherbet punch at a shower I hosted this summer and it went over big. And I LOVE your pizza dip!! I need to remember to pull that one out soon, maybe Super Bowl. Great ideas! I LOVE your pizza dip and that punch spiked with vodka sounds perfect! These simple recipes and ideas rock! Great ideas Amber! Especially the antipasto platter. Beautiful, yummy and easy! I'm bringing pizza dip to Christmas dinner! The kids and adults should love it!